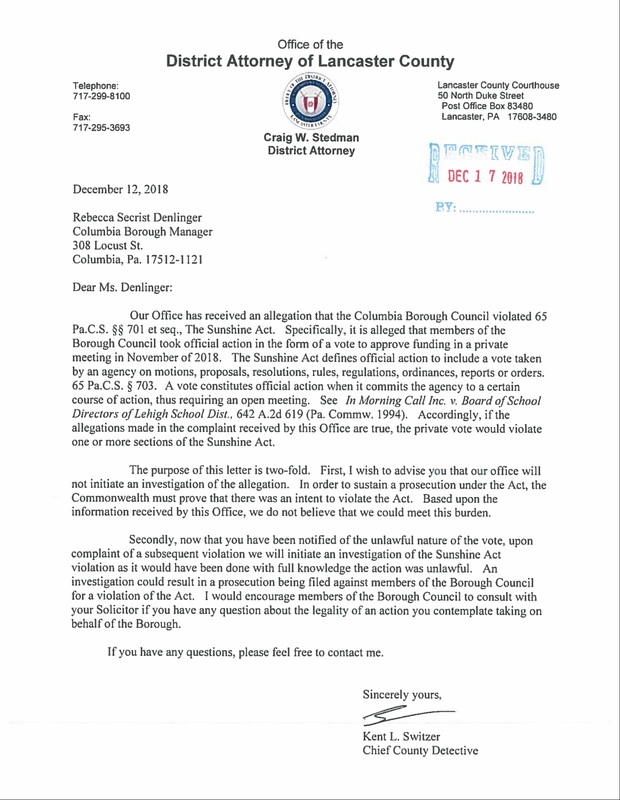 The Lancaster County District Attorney’s Office said it will not investigate an alleged violation of the state’s Sunshine Act by Columbia Borough Council. 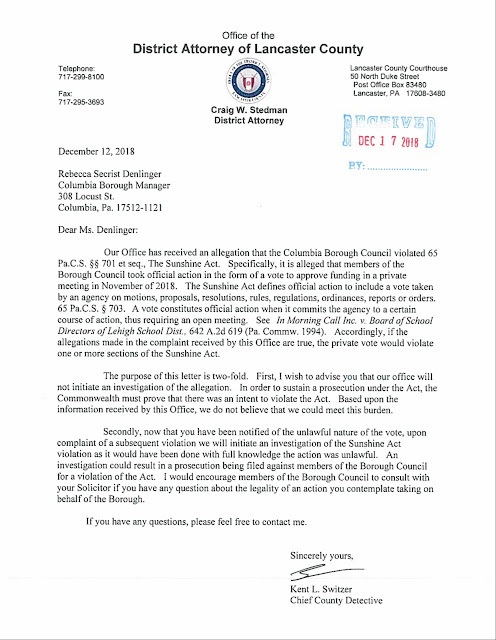 Borough resident Sharon Lintner filed the complaint after she said council voted on a funding matter in executive session during a November meeting. “That vote should have been taken in public at the Nov. 7 meeting,” Lintner told LNP on Tuesday. “I felt that was not right because we weren’t privy to where that money came from. Actually, the detective and I discussed different approaches to resolve the situation. We were both in agreement to send the letter rather than initiate any investigation at this time. The fact that the council president is still unwilling to admit any wrongdoing is the very reason we need someone else in there that is going to be transparent. The old deny, deny, deny, or is it lie, lie, lie? For clarification, I never used the words executive session, I used the words private meeting. The council president gave a non-denial denial. This Council...Mgr is WHAT you all should focus on. Plus - The School taxes increase EVERY year. Why don't residents attend their monthly meetings? The school district needs to remove ALL the assistants, superintendents, strickler, etc....they all make $100,000 per year and more..I believe up to $135,000. this is Columbia Borough we can NOT afford that. There are only a few hundred students, close the schools. Back in the day, all they had was ONE PRINCIPAL.